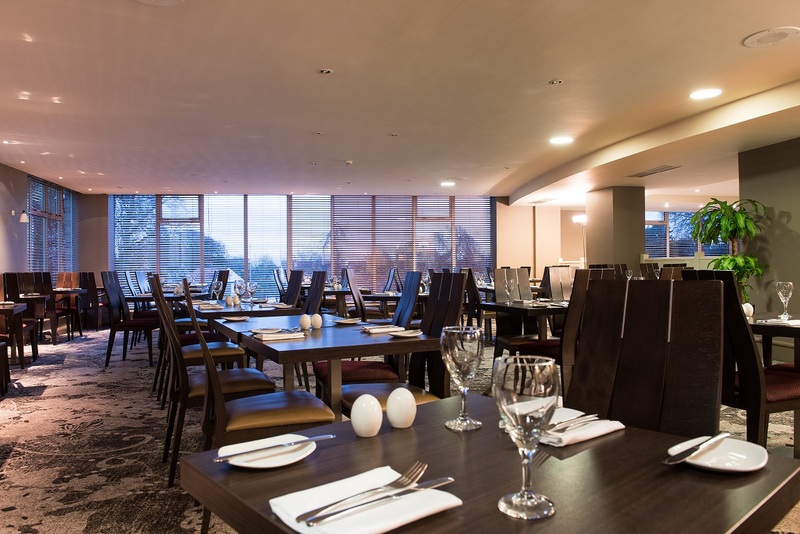 At the DoubleTree by Hilton Aberdeen Treetops Hotel, Springfield's Restaurant presents eclectic international flavours in a stylish setting. The interior features contemporary furnishings, with delicate lighting and large expansive windows offering scenic views over the hotel grounds. The Springfield's menu showcases the best of local and international dishes prepared using fresh, seasonal ingredients. Start your day with a sumptuous breakfast or join us in the bar area and enjoy a light snack, sandwich or salad in the afternoon. 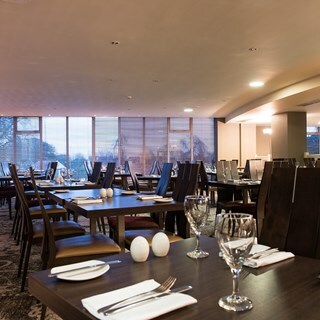 The Sunday carvery lunch is a popular among hotel guests, locals and tourists alike. The bar menu includes a wide range of wines, beer and coffee as well as an extensive gin selection. Springfield's cafe bar in Aberdeen is an ideal place to unwind with friends while catching up on some live sporting action on our large-screen televisions. Food was excellent surpassed only by the service from your very friendly staff. We really enjoyed the Sunday brunch and found it to be great value and a good selection of foods. The staff were really friendly and helpful. Food was nice and service was good however restaurant was very quiet so not much atmosphere. Enjoyed our lunch all the same. No sign of a drinks trolley as mentioned on menu? We had a groupon so excellent value for money. Soup with selection of bread or oatcakes and well presented, varied salad ( cheeses, pate, nuts, sauces, greens,  coleslaw, cold meats, mixed salad bowl). Selection of mains as seen on website plus 2 specials (pork in soy sauce or sea bass on penne pasta with a prawn sauce on the day in question). Fruit, fruit salad or mini desserts (looked like small cheesecakes). Couldn't really fault it. Very family friendly so expect kids going about or babies howling. Food well below par. Glad I got a groupon deal as certainly wouldn't pay £19 for what was served. Lovely staff though, couldn't be more helpful. Probably our fault  for booking a 3pm reservation, starters were a bit tired and meat was curling up and cheese a bit dried out, but on whole very good and a very good selection . My daughters burger was a bit burnt but again on whole the rest was very good, service was very good and couldn’t do enough for us. Would definately go back just go a bit earlier. First time we have tried brunch and it was just lovely. Great menu and cheerful friendly service, would definitely recommend ! Hi. Waiting staff were very friendly and excellent. Menu was lacking much choice for vegetarians. Main meals were very nice but with no veg with either the beef burger or the beef bourginon which was disappointing. Dessert selection was also lacking. Starter buffet was very nice - good selection. Food always very good, but restaurant was on the cold side. Delay with order but kept informed by staff who were very attentive and accommodating. Will definitely be back. We arrived on time for our table and although I had booked it in advance and also confirmed this on the day before confirmation booking ,when we arrived they did not have our booking on the list. We then proceeded to have our starter when we had the soup it was cold and not hot although  it was in a heat container. We then had tom wait well over 40m mins for our main coarse when It came it was also cold and inedible.We complained to the waiter who in turn told the Manager.We received a apology from the manger and was given a complimentary voucher for another brunch for a later date. Several other dining guests were also complaining about their meals and I believe they had problems in the kitchen. Came for grabs birthday. Staff were good, food was brilliant. Had a great night. Staff were excellent and food lovely. Would recommend it to anyone! Good service  and well presented. Enjoyed a lovely evening with excellent service from friendly helpful staff. Delicious very well presented food. Order messed up, one order not printed off therefore other steak had to be sent back to keep warm until my order was done, Chef confirmed steak would keep cooking while waiting for the 2nd order to be done. Young waiter was apologetic and attentive. Very disappointed when tip was automatically added to bill after having to wait for so long. 10% service charge should not be automatically added to bills, it should be the customer’s choice. Soup and starters were fine. Waited a long time for the main - which was okay - but no Sunday carvery. Deserts were minimal too the extreme. Staff were helpful and pleasant. Good location and could b nice but the number of people having lunch tells its own story. Not an experience we will repeat. Great service, every food order and drink order came perfectly on time and totally correct. An enjoyable meal and would definitely recommend and have another meal there again. Brunch is excellent. Great selection and quality stuff. Staff very friendly and helpful.